Your next eight minutes will be spent on first looking at the Instagram rising popularity graph followed by the features that you will have to have in your Instagram clone app and lastly, will finish with the cost estimation of how many $ it would take to develop an app like Instagram. 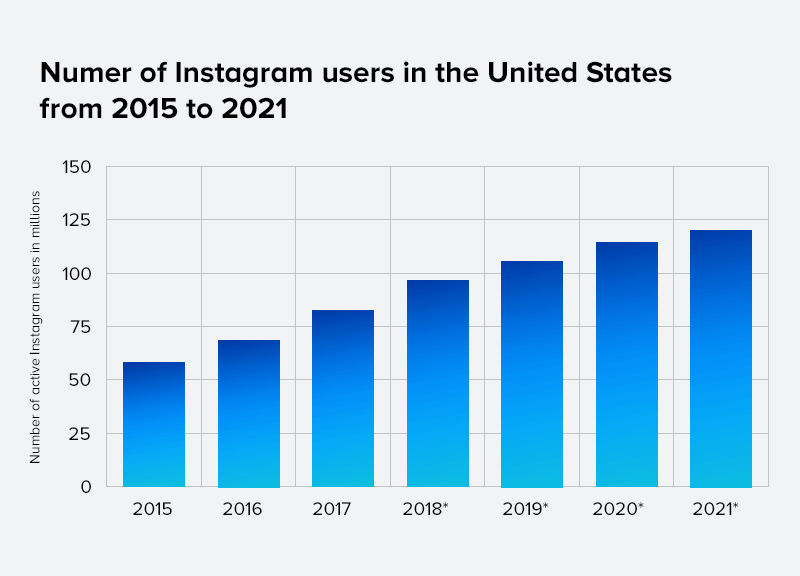 Instagram, as a social media app, has emerged as the users’ ideal choice in very little time. The growth tangent that Instagram has taken ever since its inception has set exemplary standards in the social media industry. The brand was witnessed seeing an influx in the number of active users in double-digit thousands, at the end of year one of its launch itself. The reason behind this growth? Kevin Systrom, the CEO of Instagram, focused on the business potential of photo sharing industry. The focus that has now bagged the platform 1,000 million active users, as of June 2018. And the number is estimated to only grow by manifold by the time we hit 2021. Based on simple features revolving around photo sharing and the social element of real-time messaging, the app has become a mandatory application on every device. With features as simple as this, Instagram started a photo sharing revolution that was then followed by Snapchat and a number of businesses hoping to witness the same revenue hike in their monthly app analytics report as Instagram’s. And why not, when you look at the photo-sharing apps platform itself, the number of competition is still not widespread and the tech stack that Instagram is not that complex that it will be unachievable to be adopted by SMBs. Instagram started as an app with a number of features that can be counted on hands, it took 9 years for Kevin Systrom to make Instagram as feature rich it is today. Read these Inspiring Insights by Instagram CEO Kevin Systrom, The Man Who Built A $1 Billion Startup covered in Forbes to see how far Kevin has come with Instagram. Having developed over 50 photo sharing apps, we know that both cost wise and market growth potential wise, it is always best to develop an MVP first and then keep adding features in the structure. While we are on the topic of MVPs, Read this – How To Build An MVP That Raises Money For Your Mobile App. There are several benefits associated with developing the MVP of your app like Instagram first – You will save a lot of money on the development front. You will not end up developing an exact replica of an existing app. You will get time to gauge which features of Instagram are liked and which are not. If you have stumbled upon this article in the hope of creating an Instagram clone app you are aiming to develop one with all the numerous features of the Instagram app, this is not for you. Now being good samaritans, we will not advise you to burn a hole in the pocket by adding all the Instagram Features of 2018 in your app as well. 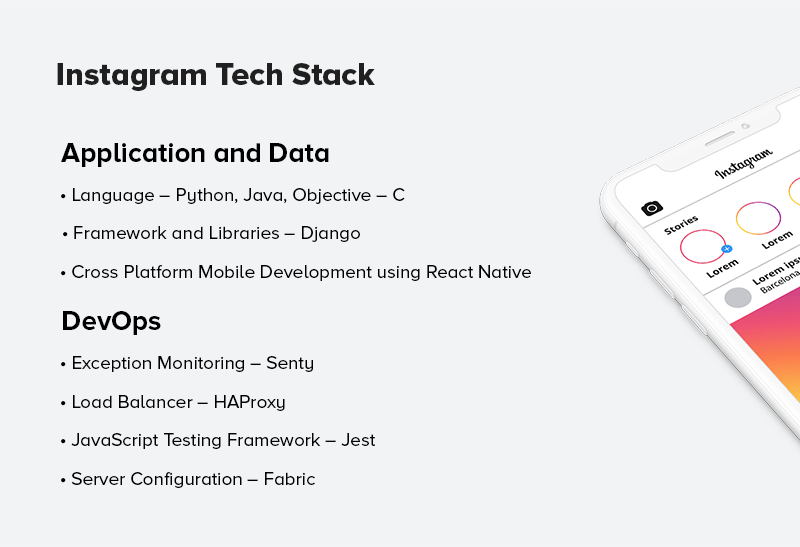 Without taking you down the rabbit hole of the several features that Instagram comes packaged within the present day, let us look at the ones that you must have in your version of Instagram app development. 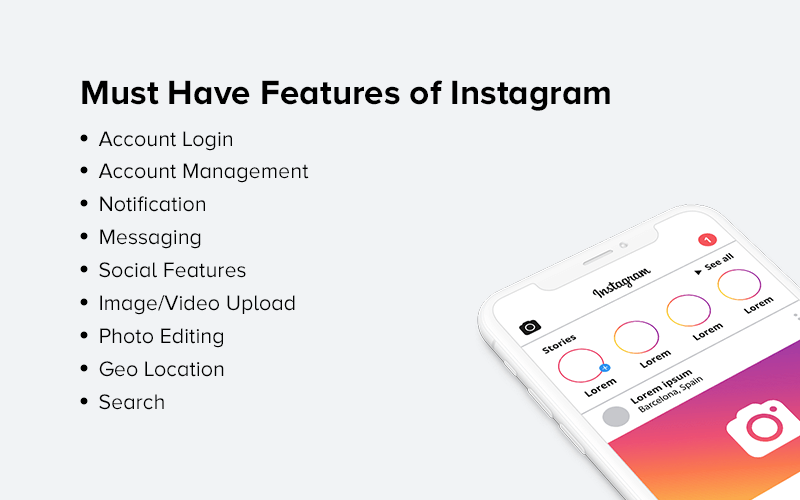 These basic features of Instagram are the must-have features of your alternative to Instagram App MVP – The ones you will focus on for at least 6 months of the app launch on the Play Store or App Store. Disclaimer: You will notice how we have mentioned Estimated Time in front of every feature. The idea behind doing this is that the answer to How much Does it Cost to Develop an App lies in the development hours. The more the development hours, the more mobile app builders charge to complete your app project. We will look at the Estimation of Photo Sharing App Development cost like Instagram after a while. For now, let us look at the different features that will be present in your app and the time it would take to develop them. Again, these features do not include Instagram’s recently added features like IGTV or Instagram Lite, etc. These are the must have features that are 100% ENOUGH to start your photo sharing app journey and create an app like instagram. When it comes to Authorization, like every second B2C app, Instagram also gives the users two options – the options that need to be present in your photo sharing application as well. Along with these, there is always an option for the users to retrieve the lost password through phone, mail or the social account. While this is happening on the front end, on the backend, you will need a database on the server to save the users’ data, an OAuth like open authorization protocol for secure social media login, and in the end, access to users’ identity for times when they forget the password. The option of Editing profile should be the next must have a feature of your photo sharing apps. Users should be given a space in the app where they can edit the profile, change the personal data like a profile picture, bio, website name, etc. On the Backend, this requires interaction between the client and the server side of the application. Your Instagram Clone App should have the feature of messaging. And in order to make real time messaging possible, it should also have a notification option to make the users aware that they have an incoming message. In the backdrop, to prevent the server from getting overloaded from constant to and fro of messages, you will have to use the RESTful API on HTTP in place of the permanent socket connections. In terms of notifications, for enabling them you will have to establish a connection with Apple/Google server by registering the device on their server. It can be done by using APN or GCM. In your app like Instagram, you can even give your users the chance to set language or enable or stop notifications, put the private mode on, etc. The essence of a photo sharing apps lies and the number one feature answer to the question on How to create a photo sharing app, is Uploading Picture or Video. In here, users can either take photos from within the app or upload the existing ones. In the Backend, if you are looking for how to build a photo sharing app for Android, you will have to first read into Camera API, MediaRecorder classes, android.hardware.camera2 API, nad SurfaceView. In Apple, you will have to add the feature using the UIImagePickerController – a part of UIKit Framework. Photo Editing is another essential feature of a photo sharing app. Whether you are developing an app like Instagram or like another photo sharing application, Image editing and modifications are must have. In the Backend, you have two options, either use standard files or develop own filters. If going with the former, copy the ready source code in the project, if going with the latter, write the whole source code on your own. Like every other social media platform on the planet, Instagram also doesn’t operate in isolation. Your users will interact with one other by sharing the images and videos from the Instagram clone app. So, when you create a photo sharing app, you will have to make the provision of linking it with other social media platforms. In the Backend, you will have to establish a connection between your app account ID and the social media account ID, by using the authentication methods offered by third parties, like OAuth. Your app should also have the feature where users add a location in the image or video. The post then needs to be added to the world map, making it possible for others to track the location of where the photo was taken. While seemingly easy, the development of this feature requires using APIs. On iOS and Android, you can achieve that with the help of Maps and Location services. On Android, it is done by using the class of android.location package and maps service through MapView class. In iOS, you will have to use CLLocationManager Class and maps service through the Map Kit framework. This is the feature using which users will find each other and what is trending on your photo sharing apps. The Last but most crucial Instagram app development cost feature is Design. If you are aiming for an Instagram clone app that repeats the success of the platform, be prepared to invest at least 60 – 70 hours on the designing front. So here were the hours of development that would go behind your app like Instagram, let us now attach a $ valuation to the hours. Let’s talk about how much would us, at Appinventiv would charge for the development on Instagram Clone App. When we (at Appinventiv) put a price tag on the number of hours of development a photo sharing app like Instagram would involve, it comes down to $36,000. 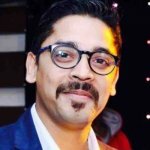 This cost estimation of Instagram App development can vary greatly according to the different geographical locations like if you are looking for a mobile app development agency in the US or Australia, it will come around $100 per hour, which would greatly increase your photo sharing and photo editing app development cost.